Extreme Performances and Extreme Machines SKS once again provides professional coverage of the 2013 Extreme Flight Championships. This is the MUST SEE event of the season! 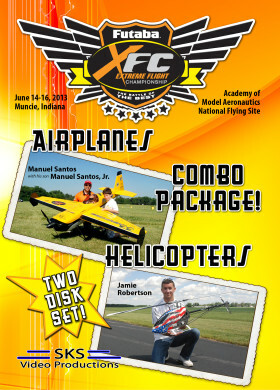 Held at the Academy of Model Aeronautics headquarters in Muncie, Indiana, this year’s event hosts helicopter and airplane pilots from around the globe. Countries represented include Canada, Mexico, France, Puerto Rico, Lithuania, Australia and of course the good old USA. These DVDs focus on the freestyle competitions. Some of this year’s outstanding helicopter pilots include: Jamie Robertson, Dunkan Bossion, Colin Bell, Kyle Stacy, Ben Storick and Kyle Dahl. Some of this year’s outstanding airplane pilots include: Seth Arnold, Gabriel Altuz, Jase “The Ace” Dussia, Daniel Holman, Manuel Santos, Donatas Pauzuolis and Jamie Hicks.Total Heli Disk Running Time: 62 min.Total Plane Disk Running Time: 93 min. Also available on Hi Def Blu-ray.